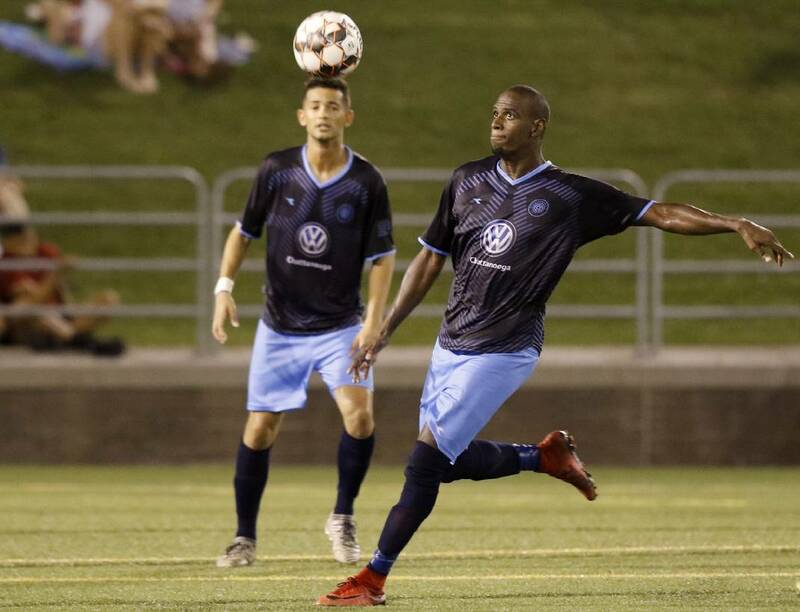 Chattanooga FC's Everson Lima, right, eyes the ball in the air during the NPSL Southeast Conference final against the Atlanta Silverbacks in July 2018 at Finley Stadium. Updated at 7:11 p.m. on Friday, March 22, 2019, with more information. Fans from many backgrounds will gather at Finley Stadium on Saturday evening as soccer season returns there with an international exhibition between the Chattanooga Football Club and Guatemalan powerhouse Comunicaciones FC. Kickoff is set for 6 p.m.
"This is more than just a soccer game. It is a chance to celebrate unity, strength and cultural diversity in our city," said Gladys Pineda, Chattanooga FC's director of international community outreach. "It's a good way to celebrate what the Latino and Guatemalan community brings to the table." A historic high school near the stadium has highly anticipated the match between two very successful clubs that have impacted families. The Howard School has seen a dramatic rise in its Hispanic population since 2013, climbing from 5 percent to 48 percent as of this semester. According to Hayden Croxall, the school's girls' soccer coach and English to Speakers of Other Languages teacher, 93 percent of all soccer players for the Hustlin' Tigers have a Guatemalan heritage. "With how political things have been recently regarding immigrants, soccer really goes beyond political barriers and speaks a language beyond linguistic barriers," Croxall said. "The sport goes straight to these kids' hearts. I am excited this game can celebrate their heritage and have a little piece of home come to Chattanooga." The power of a soccer ball has been shown to bring countries and people together all across the world, and players from the Guatemala City-based team met with the public Friday evening and signed autographs at Highland Park Commons. For the first time in club history, CFC will go up against an international first division team. In its 70th year of existence, Comunicaciones FC (or "Los Cremas") has won 30 national championships, which includes six straight. Many of its players will compete for spots on Guatemala's national team for the 2022 FIFA World Cup in Qatar. "Ever since we started Chattanooga Football Club, reaching out and using soccer to build bridges between diverse communities has been our main goal," CFC president Sheldon Grizzle said. "As the Guatemalan community has grown, we have been trying to get a match like this. It is a blessing for us to put this on for the community." CFC finished last season with a 10-6-5 overall record in the National Premier Soccer League. The club has won seven Southeast Conference championships and has four national runner-up finishes and 99 all-time wins. A portion of Saturday's game proceeds will go to La Paz Chattanooga, which has worked to empower and engage the local Latino population since 2004. "We believe in the power of the Latino community and the contributions it makes to our society," La Paz executive director Stacy Johnson said. "This is a great opportunity to bring people from near and far to Chattanooga to engage its many diverse populations." A community ownership model — now with nearly 2,300 participants — is not the only outreach CFC has done to engage its fan base. Tickets to what is the first of two international exhibitions this season at Finley Stadium cost $25 at the gate, $20 online. Children 6 years old and younger get in free.